No matter how far behind he was in the polls, Donald Trump always led in one key area: The economy. Now Hillary Clinton has closed that gap. As recently as mid-July, when voters were asked which candidate "would better handle the economy," they picked Trump over Clinton by a wide margin (54% to 43%), according to CNN/ORC polling. Now Clinton has the edge. 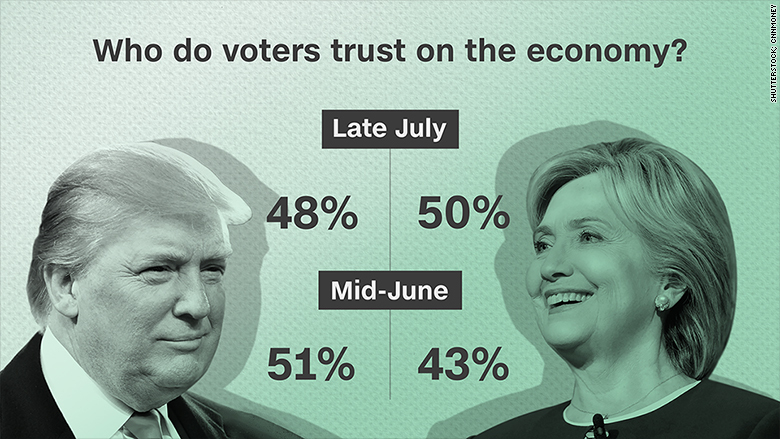 In the most recent CNN/ORC poll, conducted July 29 to 31, Clinton was ahead on the economy question, 50% to 48%. "It's almost certainly a direct result of a successful, professional, polished convention," said Larry Sabato, director for the Center for Politics at the University of Virginia. Trump's campaign meanwhile has been distracted by one controversial statement after another. His advisers have been pushing the candidate to stick to his economic message: Big tax cuts and slashing regulations. Trump tried last week, but it didn't stick. "Voters never digested his message before they were distracted by yet another misstep," said Peter Morici, a business professor at the University of Maryland. Clinton, who has her own controversies to deal with, is trying to push "Family First" economics and contrast it with Trump's "America First" theme. She wants to raise taxes on those making more than $1 million a year. 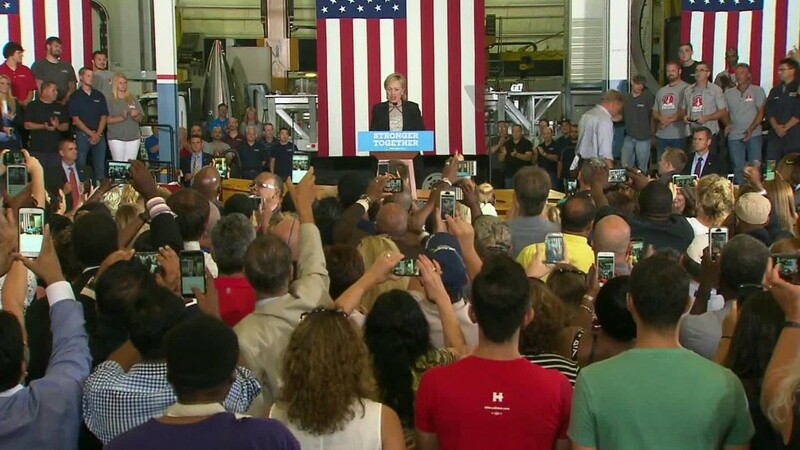 She plans to use the money to fund more spending on roads and bridges -- which Trump also supports -- and then new programs such as preschool for all 4-year-olds in America and debt-free college. On top of that, she's taking a page from the Trump playbook and talking tougher on trade. In a speech Thursday, she even promised, "When countries break the rules, we won't hesitate to impose targeted tariffs." "Although I disagree with much of what Clinton said on Thursday, her delivery was effective," said Morici, who has yet to endorse a candidate. "People are listening to her and not him." Polls have yet to come out following last week's economic speeches, but the trend heading into the week favored Clinton. Only 36% of voters now think Trump is "in touch with the problems ordinary Americans face in their daily lives," according to a CNN/ORC poll released August 1. Clinton also beat Trump in a Bloomberg poll that asked which candidate would "fight hard for the middle class." Overall, Americans sound more upbeat. The most recent Fox News poll from early August shows an uptick in Americans saying they're satisfied with the direction the country is moving in and that they believe they can "get ahead." That should favor Clinton. The Fox poll does still show Trump leading Clinton (50% to 45%) when voters are asked who is best to handle the economy, but Clinton's support has risen since the last time Fox asked that question in May. On Sunday, Trump's campaign chairman Paul Manafort tried to talk up Trump's economic plans. "As a result of this tax plan, and all of the components of the tax plan, the trade elements, the investment elements, you're going to have a situation where jobs are going to come back to America," Manafort told CNN's Jake Tapper on "State of the Union." CNN's Jennifer Agiesta contributed to this report.